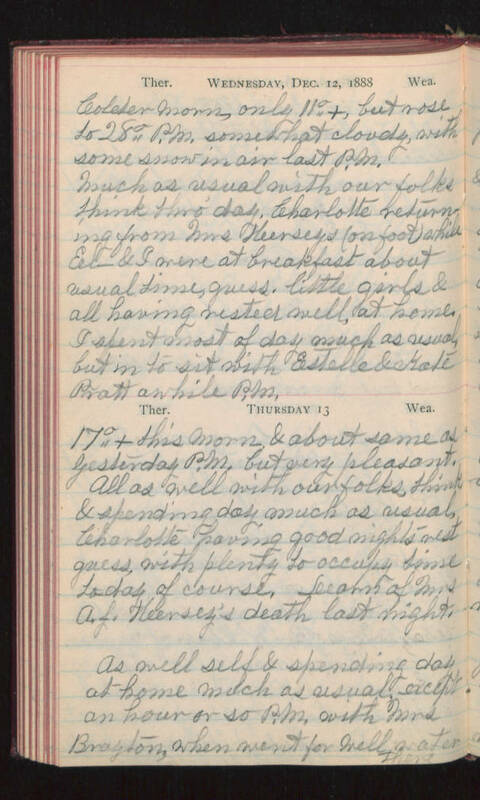 Wednesday, Dec. 12, 1888 COlder morn, only 11°+, but rose to 28° P.M. somewhat cloudy, with some snow in air last P.M. Much as usual with our folks think thro' day. Charlotte returning from Mrs Herseys (on foot) while El- & I were at breakfast about usual time, guess. little girls & all having rested well, at home. I spent most of day much as usual but in to sit with Estelle & Kate Pratt awhile P.M. Thursday 13 17°+ this morn & about same as yesterday P.M. but very pleasant. All as well with our folks think & spending day much as usual, Charlotte having good nights rest guess, with plenty to occupy time today of course. Learn of Mrs A. J. Hersey's death last night. As well self & spending day at home much as usual, except an hour or so P.M. with Mrs Brayton, when went for well water there.